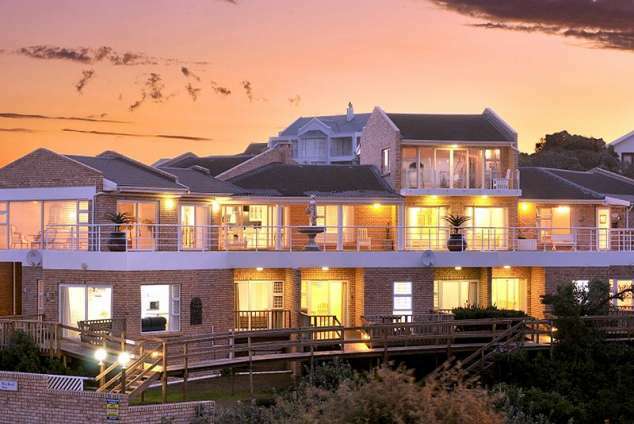 Kellys Beachfront Apartments - Port Alfred Accommodation. Kellys Beachfront Apartments is a 4 star facility, perfectly situated directly opposite the popular Kelly's Beach. This beach has achieved Blue Flag Status for the third year running, making this a very safe and clean beach. Our units are bordered by indigenous trees and prolific bird life. They are not only a stone's throw from the ocean, but also near to Port Alfred's town centre, which is 3km's away. Each unit has its own private deck with exquisite sea views from all the rooms. The four units have fully equipped kitchens (stove, microwave and full-size fridge/freezer). Complimentary tea and coffee. The bedrooms have 2 extra length single beds in plus a double sleeper couch in the lounge. Top quality linen is provided. Open plan lounge with a TV. Safe for valuables. The bathroom is complete with a shower. (Hand and bath towels provided). Each Unit has its own alarm system. Secure parking with remote control access. Rooms can be serviced at a fee. We observe a policy of non-smoking in the units. Communal braai (barbecue). East London or Port Elizabeth is about 150km away. Historical Grahamstown with all its churches and the 1820 Settlers Monument is 65km away. We are one hour away from world - renowned Shamwari Private Game Reserve and Addo Elephant National Park, home to more than 4 hundred Elephants and the Big 5. For Golf enthusiasts Port Alfred offers one of the four Royal Golf Courses. Other activities are, fishing, diving, horse riding, you name it we most probably have it. 33000 page views since 08 Mar, 2007.